Fiesta on the Hill is a community based, high-profile and energetic Festival with an attendance of over 20,000 friends and neighbors from San Francisco’s Bernal Heights area, neighboring communities and the greater Bay Area. 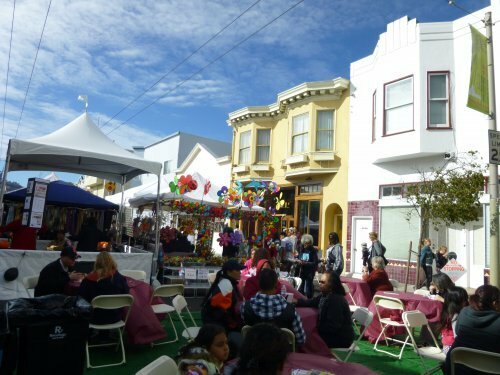 The event is in its 25th year and continues to grow and enhance the ethnic, cultural and economic diversity of the Bernal Heights District of San Francisco and surrounding neighborhoods. Presented by the Bernal Heights Neighborhood Center, an organization devoted to community action, equity and justice in the Bernal Heights area, the 25th annual Fiesta is an alcohol free event that emphasizes the importance of well being to the vitality of the neighborhood. The event includes a petting zoo, pony rides, a pumpkin patch, non-profit booths, live music on two stages, great food and a great sense of healthy, inclusive community. This entry was posted in For Fun and tagged Bernal Heights, Bernal Heights Neighborhood Center, Fiesta on the Hill, San Francisco by admin. Bookmark the permalink.